Although economic statistics in our country are highly favorable, local hunger continues to grow as wages in many areas of the economy, social security and pension payments cannot keep pace with the rapidly rising cost of living thus preventing people from meeting all their most basic needs. This is the new face of hunger and poverty in America. Hunger in our neighbors’ homes causes family distress that leads to violence, crime and the collapse of the family. Hunger in our children causes lack of physical and mental development and adds extreme stress to our educational system. Hunger in our seniors is heartbreaking as these are the hands that built and defended America. We provide food, diapers and necessities in times of need to the people of Walworth County in a respectful, cheerful and welcoming environment. Learn more and get involved. Join us for a Night at The Geneva Lake Museum and learn the history of the Geneva Lakes area while learning more about the Walworth County Food Pantry and our mission to fight hunger. Food and cocktails will be provided as you tour the museum and take a trip back into the past while we give you a glimpse of the future. Tickets available at EventBrite by clicking here. The Walworth County Food Pantry's mission began 10 years ago with Boy Scouts and their wagons and committment from their families. Nurtured by the community those roots have grown strong, flourished and have nourished our neighbors. We invite you to this special evening as we honor this heritage and celebrate new innovation to solve hunger. Tickets available on EventBrite by clicking here or typing in to Google "10 Years of Providing Hope and Solving Hunger"
In Walworth County, 44% of families report food insecurity at some point during the year. According to a recent study by United Way, 42% of Wisconsin and 44% of Walworth County residents are considered Asset Limited Income Constrained Employed (ALICE). This is the new face of hunger, the working poor who struggle to afford life's basic necessities. Based on information from Feeding America studies, 53% of this population have high blood pressure, 59% have unpaid medical bills and 32% have a member with diabetes. As high as 82% report purchasing the cheapest food available, even if they knew it was not the healthiest option, in order to provide enough food for their family. We are 100% Volunteer Driven, there are no paid employees at the food pantry. Our funding comes from the community and gracious donors throughout Walworth County. Approximately 10% of our food is provided by The Emergency Federal Assistance Program. The balance of our food is paid for by the community and gleaned from local sources as we act as an agent to Feeding America as part of their Direct Connect Program. If you think of the biggest health threats facing many older adults in America, your list may likely include cognitive decline, vision and hearing impairments, heart disease, strokes and other ailments. While each of these health issues is a threat to many American seniors, it turns out that hunger is the public health issue that is quickly becoming dire for many older adults. Here we take a closer look at what senior hunger means, why the threat is getting worse and what can be done about it. Key Facts About Senior Hunger • Nearly one in six seniors in America faces the threat of hunger or being malnourished (around 8 million total). • The rate of hunger among older adults increased 65 percent from 2007 to 2014. • One-third of all seniors report trimming the size of their meals, skipping meals completely or buying less nutritious foods because they didn’t have enough money for a proper meal. • Senior hunger costs the U.S. healthcare system $130 billion per year. For the Complete Guide to the public health crisis facing many older Americans, click here. Supplemental food supplies are available for qualifying senior citizens. Contact us for information on how to qualify and receive this additional assistance or check out the eligibility requirements by clicking here. 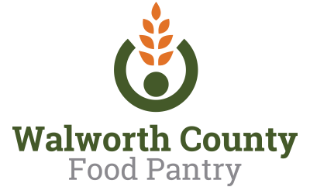 Beginning in 2019, the Walworth County Food Pantry together with the generosity of the Forest County Potawatomi Foundation are providing bags of toiletry items needed by our seniors who also qualify for the Senior Stock Box program. The Senior Assistance Mission, (S.A.M.) developed by the pantry, provides a variety of items that differ each month to include non food item. We believe these items to be a valuable assistance in the budget of our senior citizens. Incontinence supplies are also available upon request. There are consumer products that are wants, and there are consumer products that are needs. Those who have a baby at home know diapers fall very firmly into the latter category. It costs about $1,000 a year to diaper a child in the average disposable product, but one in three families in this country has trouble affording those must-have items. The diaper bank is here to help bridge the gap for families in need. Consider hosting a 'Diaper Drive' in your local group to help our bank remain full. Call or email us to receive a Diaper Drive Tool Kit. To learn more about diaper need, National Diaper Bank Network or click on the National Diaper Bank Network logo above.